"Enter the Dragon" debuts on Sept. 4 on Indemand, The Dish, TVN, Viewers Choice, and Bell cable systems. Dawn Marie introduces the show in front of a red hot crowd in the former ECW arena. 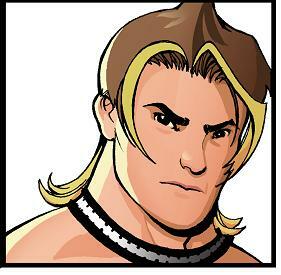 -BxB Hulk is out first. He makes an elaborate entrance with two dancers. One of the dancers is SHIMMER wrestler Daizee Haze. If this doesn't get you excited, I don't know what will. This is awesome until Hulk nearly kills Haze doing a flip off the top rope during his dance routine. The crowd is red hot for Hulk. Yamato is out next. He doesn't get the same reaction Hulk got from the fans. Lenny Leonard and Chikarason are the announcers for the evening. They do some slick chain wrestling early on before Hulk takes down Yamato with a dropkick and the crowd goes nuts. Yamato cuts Hulk off and targets his leg. The action spills to the outside where Yamato tossed Hulk's leg into the barricade. Hulk fired back with a kick, but Yamato immediately takes him out again with a kick to the leg. Yamato locks in a leg submission and the crowd chants "BxB Hulk, BxB Hulk," as he struggles to reach the ropes. Yamato nails Hulk with a series of big chops in the corner and gestures to the crowd. Hulk counters Yamato and hit a springboard missile dropkick. Hulk does an insane move where he flips off Yamato's chest and nails him with a clothesline all in one motion and the crowd goes nuts again. Hulk hits an insane leg sweep and then a standing corkscrew senton for a 2 count. Both men exchange forearms in the middle of the ring. The crowd goes nuts, but Yamato takes Hulk down with a running forearm off the ropes for a 2 count. Yamato follows up with a spear and then locks in the cloverleaf on Hulk in the middle of the ring and the crowd goes nuts once Yamato makes it to the ropes. Yamato drags Hulk back to the middle of the ring and applies the crossface, but Hulk gets the ropes again. Hulk countered a power move from Yamato. Yamato tried to go up top, but Hulk nailed him with a spinning kick to the head. Hulk then hits a moonsault slam off the top and the crowd erupts as both men are slow to get to their feet. Hulk nails Yamato with a punk after a slick series of kicks. Yamato is down and Hulk misses with a superkick, but connects with a follow up kick to the back of the head. The heat for this match is unreal. Hulk goes for the phoenix splash, but misses and lands flush on his knee. Yamato gets up and smiles when he sees Hulk is in pain. Yamato hits a brainbuster on Hulk, but he kicked out at the last second. The crowd continues to chant in support of Hulk, who counters Yamato and nails him with an overhead kick. Yamato grabs a sleeper and then nails Hulk with a sleeper suplex, but Hulk kicked out again. Yamato lifts up Hulks and nails him with an incredible looking DDT for the pin. STAR RATING (****) – This was a fantastic opening bout that went over 15 minutes. The crowd was just red hot with their support of Hulk throughout the match as Yamato targeted his legs. These guys are so amazing the way they can pull off a seamless series of exchanges and counters. The kicks Hulk hit on Yamato down the stretch were simply awesome. After the match, a series of highlights aired. Awesome. -We are taken inside the locker room to look at the combatants in the main event. The narrator tells us we are looking at Naruki Doi. He is the champion of Dragon Gate the narrator tells us and he's on a huge roll in 2009. We are then shown Shingo getting ready in another locker room. The narrator tells that Doi took "Ace" status from Shingo at the end of 2008. The narrator closes by telling us that the winner of the main event will be the top dog in ROH. -It's time for the CHIKARA 8 Man Tag match. The heels are out first with F.I.S.T., Hallowicked, and Amasis making their way to the ring. Mike Quackenbush gets an incredible reaction when he comes out with the babyfaces, as the crowd noise drowns out their entrance theme. The atmosphere is electric, as the crowd takes churns chanting for all of the members of the babyface team. The announcers mention that Hallowicked isn't a heel, but he's in the match because he won a random drawing to get on the PPV. The match is held under the rules that state as soon as one wrestler leaves the ring another may enter from his team. The crowd boos Icarus heavily when he enters the ring, but Quackenbush quickly tosses him to the outside. Hallowicked runs into the ring and engages in a seamless series of Lucha counters with Quackenbush. The crowd is going nuts for this and it's awesome. Quackenbush & Jigsaw work together to send Hallowicked to the outside with an awesome looking double team headscissors that saw Quackenbush rotate Jigsaw's legs. Soldier Ant runs into the ring and sends Akuma to the outside with the saluting headscissors after Akuma had kicked Jigsaw to the outside. Hallowicked & Amasis work together to ground Soldier Ant. The crowd really hates F.I.S.T. and the heat for this match is amazing at this point. Amasis goes for his unique break dancing version of the people's elbow, but Solider Ant manages to get out of the way. Quackenbush gets the hot from Soldier Ant and goes to town on Icarus. Jigsaw sends Hallowicked to the outside, but Akuma cuts him off at the apron as he's going for a dive with a kick to the head. The crowd chants for Jigsaw as Icarus works him over. Amasis tags into the ring and continues to work over Jigsaw. These guys all have such unique looks and move about 100 mph in the ring. This is incredible. The crowd tries to rally Jigsaw, but Akuma power bombs his partner, Icarus right on top of him for a nearfall. Jigsaw finally fires back and takes out F.I.S.T with an insane dive to the floor. Fire Ant nails Hallowicked with a dive off the top and follows up with a spinning headscissors. Fire Ant counters Akuma about 7 times before taking him down with a DDT. That was sick. Amasis runs in and faces off with the colony. He does the MC Hammer dance, but ends up taking a double team big boot from the Colony. The Colony hits ants marching on Akuma, but Icarus breaks up the pin. 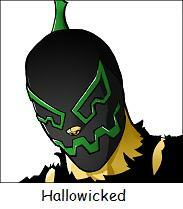 The action continues at a rapid place, as Hallowicked hits go to sleepy hallow on Fire Ant. That's hilarious. Soldier Ant hits the saluting diving headbutt on Hallowicked, but Amasis breaks up the pin. Quackenbush takes his head off a short time later with a sick clothesline. Akuma cuts of Jigsaw & Quackenbush. He sends Quackenbush outside and nails Jigsaw with a top rope moonsault, but Jigsaw kicked out and the crowd goes insane! The faces run wild on the heels with an insane series of big moves. Quackenbush and Soldier Ant take out the heels on the outside with a series of insane dives. Jigsaw was left alone in the ring with Icarus and he ended up finishing him off with the Jig n' Tonic for the pin! STAR RATING (****1/4) – This was awesome. There's no other way to describe this match, but by saying it's one of the most unique things you'll see in a wrestling ring in your lifetime. The colorful personalities, the hated heels, the beloved babyfaces, and the insane Lucha action was incredible. Quackenbush got on the mic after the match and the crowd went nuts. He said Dragon Gate and CHIKARA make a great combination. He said they're all part of the same family because many of them were trained by Jorge Rivera. A video package on Rivera airs that is awesome. Quackenbush says he feels like there's a sibling rivalry growing and issues a CHIKARA vs. Dragon Gate Challenge. Yamato comes out to answer Quackenbush's challenge. He says something in Japanese on the mic and then kicks Quackenbush in the junk. The crowd boos until Jigsaw runs out to make the save. Akuma runs back to the ring as well, but ends up turning on Jigsaw by kicking him in the junk. Akuma and Yamato put the boots to Quackenbush & Jigsaw until several wrestlers run out from the back to make the save. This was a good angle to set up a match on the next DGUSA PPV. The announcers talked about the rivalry between Kid and Yoshino in Dragon Gate. They came to a stalemate early on and the crowd chanted for Yoshino. Kid went for a 6-1-9 right off the bat, but Yoshino got out of the way. The crowd began a chant for Dragon Kid. Chikarason talked about how in awe he was of these two guys when he first saw them wrestle. Yoshino slowed down the pace momentarily and went to work on Kid's arm. Yoshino continued to work Kid's arm for several minutes and took him down in a unique hammerlock, but Kid managed to slide his foot under the ropes. Kid fired back and went for a springboard, but Yoshino cut him off. Kid finally fired back and hit the déjà vu. Kid followed up with the Bermuda Triangle to the outside and the crowd went nuts. Kid favored his arm before setting up a springboard missile dropkick, which resulted in a 2 count. Yoshino ducked a charge in the corner and ran the ropes at an amazing speed as he took Kid down to the mat with a clothesline. Yoshino went up top, but Kid cut him off. Kid blocked a sunset bomb and sent Kid into the ropes with a hurricanrana. Kid then hit the 6-1-9 and went for another hurricanrana, but Yoshino countered with a powerbomb. Both men were down momentarily and Kid got to his feet and locked Yoshino in octopus submission. Moments later, Kid went for a double springboard moonsault, but Yoshino got his knees up. Yoshino went up top and waited for Kid to get to his feet and then he nailed him with a huge double stomp for a nearfall. Kid blocked the lightening spiral and hit an incredible looking DDT and the crowd went nuts again. Both men went at it on the top turnbuckle again. This time, Kid slipped off, but followed up with an incredible hurricanrana off the top for a nearfall and the crowd chanted "Dragon Kid, Dragon Kid." Yoshino fired back and locked Kid in a nasty-looking arm submission, but had to let go because his shoulders were down. Kid countered Yoshino and nailed him with a stunner. Kid then the ultra hurricanrana for pin. Several replays from the match aired after the finish. The crowd chanted for both men after the match. Yoshino ended up shoving Kid. Shingo and Doi then went face-to-face, but nothing happened. STAR RATING (***1/2) – Another really unique match that you won't see anywhere else. The speed Kid and Yoshino wrestled at times was amazing. These guys pulled off so many counters on each other and the announcers did a good job of talking about their rivalry in Dragon Gate. Yoshino has some really cool arm submissions that he employs, but every time I see Dragon Kid, I'm just in awe. He really is the modern day Rey Mysterio. -An ad for DGUSA aired that featured Evan Bourne and Jushin "Thunder" Liger. Both teams shook hands before the bell rang. The crowd was red hot as Yokosuka and Matt locked up to begin the match. Mike Quackenbush joined Lenny Leonard on commentary. The action was hot right off the bat as Matt took Yokosuka down with a head-scissors and mocked his pose. Nick tagged in and took down CIMA. The Young Bucks then hit stereo dropkicks on CIMA and the crowd went nuts. Yokosuka ran and took a gutbuster/neckbreaker combo. Yokosuka managed to drive Nick into his own corner and CIMA took him down to the mat. Leonard said this show would show the pecking order in DGUSA and a win for the Young Bucks here would shoot them to the top. Yokosuka & CIMA hit stereo elbows on Nick and posed for the crowd for an ovation. Nick managed to drive Yokosuka into his corner and tagged in Nick, who came off the top with a double stomp to Yokosuka's elbow. The Young Bucks showed some excellent teamwork here, as they continually tag in and out of the match to keep things going at a high pace. Yokosuka blocked a suplex attempt from mat and tagged in CIMA. Nick managed to get a blind tag and The Young Bucks hit an elevated dropkick on CIMA. CIMA quickly cut Matt off with a stiff kick and tagged in Yokosuka for a double team suplex. Yokosuka applied a body scissors on the mat and CIMA ran in and raked Matt's eyes. CIMA & Yokosuka hit a fantastic looking double team gutbuster on Matt, but Nick broke it up. The action spilled outside and Yokosuka lifted up Matt while he was holding the guardrail. CIMA then followed up with a springboard double stomp onto him and the crowd roared. CIMA kicked several times in the chest while he was on his knees in the middle of the ring. Matt told him to bring it on and CIMA obliterated him with several more kicks to the chest. Matt blocked a double team attempt and used CIMA's chest to hit sliced bread #3 on Yokosuka. He then hit a neck breaker on CIMA and tagged in Nick, who ran wild. Matt hit a dropkick through the ropes onto Yokosuka and CIMA. Nick then jumped over Matt and hit a twisting body press that took out both men. Wow! This is incredible action. CIMA managed to counter nick moments later and nailed him with a devastating double stomp. After an incredible series of counters, The Young Bucks ended up stacked in the corner and CIMA nailed a double lung blower on both men. The crowd went nuts as Yokosuka attempted to finish Matt off, but he countered with a backdrop. Matt tried to go up top, but Yokosuka cut him off and hit an exploder suplex off the top. Nick managed to dodge Yokosuka moments later and used the ropes to springboard himself over the top of him for a stunner! Matt tried to go up top, but CIMA cut him off. CIMA went for a frogsplash, but Matt got his knees up. CIMA hit the perfect driver on Matt, but he kicked out. CIMA sent Matt crashing to the floor with a kick as Yokosuka slammed mat into the corner. CIMA set up to the other side of the ring and hit the coast to coast dropkick. CIMA & Yokosuka hit a double team facebuster, but Matt made the save at the last second. Matt dodged a superkick from CIMA, who nailed Yokosuka. The Young Bucks hit the more bang for your buck for the pin on Yokosuka. The entire crowd was on their feet for the finish! The crowd chanted for The Young Bucks after the match and threw streamers. Several replays of the incredible action aired as the crowd began chanting for CIMA & Yokosuka. The crowd then broke into a "Dragon Gate, Dragon Gate" chant. All four men then posed for the crowd and held their hands up. STAR RATING (****3/4) – This was an incredible match. These four guys absolutely tore it up and had the crowd in the palm of their hand the entire time. I've said this before, but you just don't see tag matches that are this good very often. 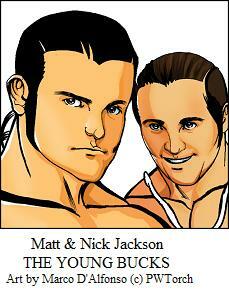 The Young Bucks came off as stars here with their performance. The Jackson brothers were at a disadvantage more often than not, but their incredible comebacks and double teams lit up the crowd. CIMA & Yokosuka were awesome as well and showcased some really innovative offense. You've got to see this match. It was breathtaking. 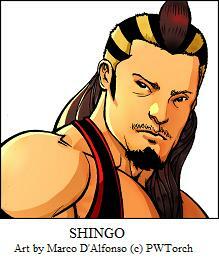 -Shingo was shown backstage getting ready for the main event. The narrator said there was no title on the line, but pride was on the line and we would find out who was the top guy in DGUSA. They then showed Naruki Doi getting ready for the main event. The narrator said Doi was a star in Japan, but he was back at square one in the USA. The narrator said the time for waiting is over and sent us to Shingo's ring entrance. The crowd chanted for both men prior to the start of the match, but they weren't as hot as they were for the start of the previous match. They did some chain wrestling to start the match and came to a stalemate, which the crowd applauded. Doi went for a leapfrog, but Shingo countered it into an ace crusher. The crowd chanted for Shingo as he nailed Doi with a fist drop. Shingo went up to the second turnbuckle and went for the double knees to Doi's chest, but Doi got out of the way and immediately targeted Shingo's knee. The crowd chanted for both men as Doi continued to work over Shingo's leg. Doi locked in a figure 4 in the middle of the ring and the crowd went "woooo." Shingo struggled for a long period of time, but managed to grab the ropes to break the hold. Doi went for a cannonball in the corner, but Shingo caught him, dead-lifted him, got to his feet, and nailed him with a powerbomb. Wow, that was freaking incredible! Shingo followed up with a knee-drop and ended up hurting himself in the process. Both men began exchanging chops, but Shingo won the exchange and Doi crashed to the mat. Doi hit a boot to Shingo's chest and bounced off the ropes, but Shingo managed to obliterate him with a clothesline. Shingo lifted up Doi and held in the suplex position and the crowd counted to 30 before Shingo suplexed him to the mat for a 2 count. Shingo continued to overwhelm Doi with chops and strikes in the corner. Doi got his boot up as Shingo went for a charge in the corner and bounced off the ropes, but Shingo caught him with a powerslam and locked in a nasty submission on the mat. Doi struggled for a long time, but finally reached the ropes. Shingo dragged Doi over to the ropes and attempted to suplex him to the mat, but Doi blocked it. Doi ended up tying up Shingo in the ropes and went up top before nailing him with a flipping senton and the crowd went nuts. Shingo tried to fire back, but Doi nailed him with a dropkick to the knee. Doi went for a charge in the corner, but Shingo caught him again and suplexed him to the mat. Shingo ended up hurting his knee in the process, but rallied with the support of the fans to his feet. After a series of counters, Shingo nailed Doi with a facebuster on the second try and covered him for a nearfall and the crowd applauded as both men were down on the mat. Both men exchanged strikes in the center of the ring, but Doi eventually caught Shingo with a sitout powerbomb for a 2 count. Doi went up top, but Shingo cut him off. Doi tried to nail Shingo with a powerbomb, but Shingo managed to fend him off. Doi ended up hanging Shingo upside down and nailed him with a huge cannonball in the corner. Doi then went up top and nailed Shingo with a super belly to back suplex for a nearfall! Shingo countered the muscular bomb, but couldn't capitalize. Moments later Shingo hit a big lariat and a DVD for a nearfall and the crowd gave both men a big ovation. Shingo nailed Doi with several strikes and Doi staggered around the ring. Shingo lit up Doi with several strikes and nailed him with sitdown slam that folded Doi up for a great nearfall. Moments later Doi hit the Doi 5's and a running dropkick, but Shingo hot his foot on the ropes at the last second to break up the pin. Shingo countered Doi again and dumped him on his head with another power move, but was unable to make the cover. Both men got their feet and exchanged forearms. Doi hit another sliding kick on Shingo moments later and followed up with a tiger suplex with a bridge, but Shingo kicked out at the last second. Shingo fired up and told Doi to bring it. Doi nailed him with another sliding kick, but Shingo would not stay down and he kicked out again. The crowd began chanting for Shingo. Doi picked up Shingo and nailed him with the muscular bomb for the pin! The crowd got their feet once again and gave both men a standing ovation. A huge "Dragon Gate, Dragon Gate" chant broke out as Doi held up his title. Lenny Leonard signed off as several replays aired from the match. STAR RATING (****1/4) – This was another awesome match. It didn't steal the show, but it was different than all of the other matches on the card as both guys wrestled a strong-style main event. Shingo was awesome in this match and he hit Doi with a ton of incredible power moves that made my jaw drop. The announcers did a really good job of making the match seem important even though the title wasn't on the line. Doi really impressed me as well with his slick submission wrestling, power moves, and stiff strikes. I love the finish of the match where Shingo just kept coming at Doi until finally taking his finish for the pin. Overall score (10.0): This is one of the best PPVs I've ever seen from a wrestling standpoint. If you love good wrestling, you have to order this show. Every match is like opening up a great present on Christmas morning. There's just not a bad match on the card. The opener set the tone for what was a fantastic 2 hours of wrestling. The crowd was red hot for this show from start to finish and Hulk and Yamato set the template for what DGUSA is going to be all about on PPV. They had a fantastic match filled with unique maneuvers and counters. Things only got better with the CHIKARA 8 Man Tag match. The crowd was just red hot for the CHIKARA guys. The heels were hated and the babyfaces were loved. These guys look so unique and wrestle unlike any other wrestlers you'll see anywhere. I loved watching these guys pull off so many Lucha spots, counters, transitions, and reversals. The finish was just awesome with the crowd going nuts for Jigsaw as he finally got the pin on the hated Icarus. What else was on the card? Well, there was an insane MOTYC contender with the Young Bucks putting their stamp as one of the best tag teams in the business today with an incredible performance against CIMA & Yokosuka. If you've only heard about what Matt & Nick Jackson can do in the ring, you're in for a real treat once you see this match. The crowd just falls in love with the Young Bucks. Dragon Kid and Yoshino had the worst match on the show, but it was still very good. They built the match off a series of counters and Dragon Kid looked great here, but it just felt like something was missing to take the match to the next level. The main event was great and very different from the other matches on the card as Doi and Shingo put on a classic heavyweight wrestling match. I can't believe how much these two guys have improved since their first days appearing in ROH. Shingo was awesome here hitting insane power moves, but Doi got the win in the end to establish himself as the top guy in the promotion. The only thing that was underwhelming was the ring announcing of Dawn Marie, who just didn't seem comfortable in her role, but she wasn't horrible either. For $20, this show is an absolute steal. It's one of the most unique wrestling shows I've ever seen. I can't imagine anyone ordering the show and being disappointed. They're so many great personalities on this PPV and the crowd is red hot from start to finish. I think in the future this is going to be a show people look back upon fondly as one of the better PPVs they've ever seen.